Blue Link is a dynamic and innovative telematics solution that combines safety, car care, remote functionality and infotainment into a complete package. 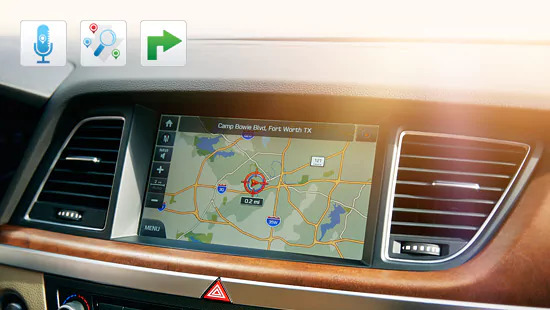 It helps simplify the life of Hyundai owners and reduce distracted driving. Your local Hyundai Dealership can assist you in the enrollment process during your vehicle purchase or at any point in the future. The Blue Link button provides access to a voice-response menu of services. The center button is used for Enhanced Navigation services like Destination Search Powered by Google. Pressing the SOS button connects users with a live agent who can provide emergency assistance. A detailed list of voice-response commands are available in the Blue Link User Manual. Why do I need to download the mobile app to my smartphone? Which app is right for me- Genesis Intelligent Assistant App or Blue Link App? The mobile app connects Hyundai Blue Link subscribers to their vehicle via their smartphone. You will be able to execute remote features like Remote Start and have additional Blue Link content at your fingertips! 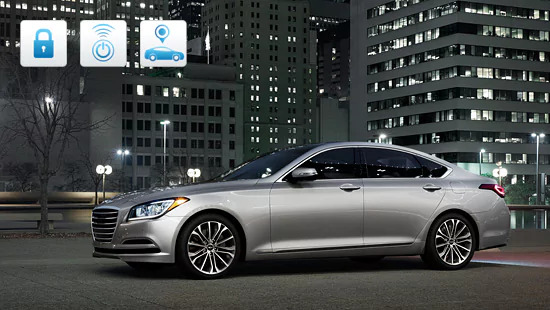 The Genesis Intelligent Assistant App only supports the 2015 Genesis Sedan. However, all Blue Link-equipped vehicles are supported by the Blue Link mobile app. A Blue Link subscription to the Remote Package is required to execute remote features. Enhanced Roadside Assistance works in conjunction with your vehicles Hyundai Assurance 24/7 Roadside Assistance coverage. GPS coordinates for your vehicle will be provided to the Blue Link Customer Care agent when making a Roadside Assistance call from inside the vehicle using the Blue Link button. Log-in to MyHyundai and click on the Blue Link logo, select "UPDATE MY PIN". If you forget your PIN, contact 855-2-BlueLink (855-225-8354) and speak to a Blue Link Customer Care agent. What packages does Blue Link offer and how much do they cost? There are three Blue Link packages: Connected Care, Remote and Guidance. The Connected Care Package comes with a complimentary one year trial for all new, Blue Link-equipped Hyundai vehicles. A three-month trial for Remote and Guidance is available when you sign up using your credit card. After the trial period is over, each package is available for $99/year. (Restrictions may apply based on your current vehicle.) Connected Care is a comprehensive safety and car care package that offers peace of mind no matter where you are. Call Center agents are standing by 365 days, 24 hours a day to summon help or provide emergency assistance. The Remote package gives you convenient access to features via the web or smartphone app. You can Remote Start your car, use Remote Climate Control (if equipped), unlock/lock your doors or locate your car when you forget where you parked it. The Guidance Package provides more than just the quickest route to your destination. Destination Search powered by Google is perfect for those looking for new local knowledge. Blue Link launched on the 2012 Sonata and is currently available on most 2013-2015 Hyundai models with the exception of Accent. Will Blue Link use my cell phone connection to provide me with safety, security and car care services? Blue Link is an embedded system, which means that you will be able to use most of the features without the need to have your cell phone in the car. However, some functions are enhanced with your cell phone through the mobile application like remote features. Blue Link Connected Care is a suite of safety and car care features providing Hyundai owners with services such as Automatic Collision Notification, SOS Emergency Assistance, Enhanced Roadside Assistance, Monthly Vehicle Health Reports and Maintenance Alerts. All new Blue Link-equipped Hyundai vehicles will come standard with one year of Blue Link Connected Care. The service is fully transferable to subsequent owners within one year of the vehicles date of first use. For further information regarding Blue Link Connected Care, please visit MyHyundai.com. The Monthly Vehicle Health Report contains a comprehensive, straightforward diagnostic evaluation involving most aspects of your vehicles performance. You can change the monthly delivery date by logging-in to MyHyundai.com. If you have any questions about Blue Link, please call Blue Link Customer Care at (855) 225-8354 or send an email to customercare@hyundaibluelink.com. You can contact Blue Link as often as you like. For your convenience, you can contact one of our Blue Link Customer Care agents from the car by pressing the Blue Link button, from your smartphone mobile app or from MyHyundai.com. There are no a la carte options currently available; however, Blue Link is bundled in three, easy-to-use packages that offer extensive value for all users.